Sheffield United came from behind to draw 1-1 at home to Oldham. 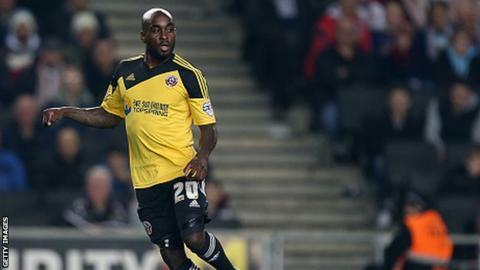 A 63rd-minute goal from substitute Jamal Campbell-Ryce cancelled out Jonathan Forte's first-half strike. Forte struck after getting on the end of Daniel Johnson's superb ball into the area, while Campbell-Ryce's equaliser was a low, angled shot through a packed penalty area. Oldham's Jabo Ibehre was sent off with three minutes remaining after being shown a second yellow card. "It was not good enough today, I'm very disappointed with the way we played. "It's a good point, when you're 1-0 down at home, to come back and not lose, but too many lads were not quite at it today. "Oldham were the better team, certainly in the first half. We talked about what a good, settled side they are and they won't be fazed by coming here." "It was a good game, obviously the game was full of swings and turns. "I think we were quite comfortable. I was pleased with my players. "What I was disappointed with was a 15 minute spell in the second half where we gave away the ball too much." Match ends, Sheffield United 1, Oldham Athletic 1. Second Half ends, Sheffield United 1, Oldham Athletic 1. Paddy McCarthy (Sheffield United) wins a free kick on the left wing. Jay McEveley (Sheffield United) is shown the yellow card. Attempt missed. Timothee Dieng (Oldham Athletic) header from very close range is close, but misses to the left. Second yellow card to Jabo Ibehre (Oldham Athletic). Attempt missed. Jamie Murphy (Sheffield United) right footed shot from the centre of the box is high and wide to the left. Substitution, Oldham Athletic. Dominic Poleon replaces Daniel Johnson. Attempt missed. Joseph Mills (Oldham Athletic) left footed shot from outside the box is close, but misses to the left. Attempt blocked. Jamal Campbell-Ryce (Sheffield United) right footed shot from the left side of the box is blocked. Foul by Jabo Ibehre (Oldham Athletic). Corner, Oldham Athletic. Conceded by Chris Basham. Corner, Oldham Athletic. Conceded by Jay McEveley. Attempt missed. Daniel Johnson (Oldham Athletic) left footed shot from outside the box is high and wide to the left. Attempt saved. Chris Basham (Sheffield United) left footed shot from outside the box is saved in the top centre of the goal. Goal! Sheffield United 1, Oldham Athletic 1. Jamal Campbell-Ryce (Sheffield United) right footed shot from a difficult angle on the right to the bottom left corner. Attempt missed. Jabo Ibehre (Oldham Athletic) right footed shot from the right side of the box is close, but misses to the right. Foul by Daniel Johnson (Oldham Athletic). Stefan Scougall (Sheffield United) wins a free kick on the left wing. Attempt missed. Genséric Kusunga (Oldham Athletic) right footed shot from the right side of the six yard box is close, but misses to the right. Corner, Oldham Athletic. Conceded by Jose Baxter.